Videos of dogs doing smart, crazy and stupid things can make one think that they’re angels. Most dog owners see their pets as their child or their best friend – the best thing to happen in their lives. Dogs, despite being trained to be domesticated and smart these days, are still animals – the very reason that when provoked or agitated defaults to their primal nature. This is what takes center stage when you hear news about a dog attacking a child or an elderly woman that will just abruptly change your mind. On this course, two experts in the field of animal services are our resource speakers. Nick Lippincott is a Senior Animal Service Officer at Orange County, Florida. He sits on the Board of Directors of the National Animal Care and Control Association (NACA). Meanwhile, Dan De Sousa has an extensive experience in Animal Service for the County of San Diego, California. He served as an Animal Control Officer and is currently the department’s Director and Public Information Officer. He is with the Executive Board of the National Council on Violence Against Animals (NCOVAA) and previously served at NACA’s Board of Directors and the State Humane Association of California’s Board of Directors. The breed vs. deed debate on determining a dangerous/vicious dog. 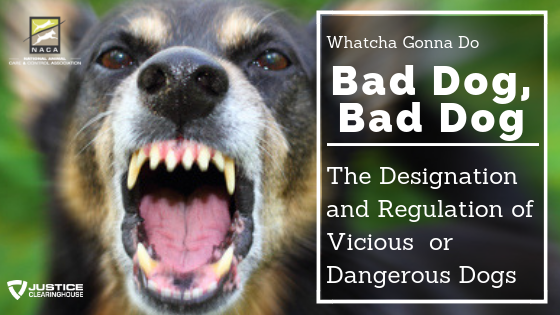 Defining dangerous/vicious dogs based on the legislature in various jurisdictions. What potentially dangerous dog means. How a dog becomes a part of and gets removed from the dangerous dogs’ list. The consequences for the dog owners. The challenge encountered by agencies in proving whether a dog is dangerous or not. Looking at the element of provocation as the distinguishing factor on dog attack/bite incidents. How San Diego County was able to clarify provocation by inserting the concept of lawful activity. The critical steps of documentation and abiding by the due process when trying to enforce animal law. Factors to consider when working with such cases, and what makes a public nuisance animal and owner. Conditions and restrictions used in both San Diego, CA and Orange County, FL when monitoring and registering dangerous dogs. Noting the differences between state and local law and understanding the definitions of concepts and terms when enforcing the law within a jurisdiction. How California and Florida declare or classify a dog as dangerous. The Responsible Pet Owner Course that both agencies are conducting to educate owners who violated any animal-related law or owns a dog deemed dangerous. The importance of being wary of the public’s perception in dog attack cases and incidents. Using bite scales to determine the severity of the attack. Returning and monitoring the declared dangerous dogs. Conducting the Responsible Pet Owner Classes and the contents of the curriculum. Integrating humane approaches to the law. Tools and techniques that may be used in dog bite/attack incidents.